Spring has officially arrived, and with it comes the end of soup season. As much as I love the warmer weather, I always find it a little bittersweet to put away my hot and hearty creations. There is just something so satisfying about a steaming, restorative bowl of meat and veggie-filled liquid goodness. A new week calls for a fresh line up of recipes and this go round I determined it high time we dove into the land of crepes. Crepes, for me, are the best of all worlds. They’re versatile, they’re stuffable and, greatest of all, they’re delectable. They work well for company because you can make them ahead of time and they work well for kids because they’re fun to eat. My husband has been begging asking me to cook up a pot of jambalaya for some time now. Every time I inquire what he’s hungry for, that one Cajun inspired word escapes his lips and lands in my lap with a thud. Now don’t get me wrong. It’s not that I don’t enjoy jambalaya, much to the contrary. The problem I have is that well constructed Jambalaya takes time. Time to stew and time for all those wonderful French Southern flavors to meld together. As you can well imagine, this is something I don’t normally have when it comes to a typical weeknight dinner. And so my husband continues to ask and I continue to say next time. Until this past weekend that is. Every so often the creole stars align and a night arrives where dinner takes center stage on the daily roster. This past Sunday was just such a day. With the Packers set to play a big football game (no I don’t want to talk about how it all went down – grrr) and a Monday school holiday for the boys, I determined that the day had finally arrived for a hot and hearty pot of protein laden jambalaya. Let me tell ya, it was certainly worth the wait. I got a little carried away in the seafood department and pretty much added one of every crustacean available including shrimp, scallops and crab. The recipe only calls for shrimp, but if you feel the need as I did to add more, by all means do so. Begin with a handful of spices; nine to be exact. Drop them into a bowl and let a few chicken legs have their way with them. Sear the covered legs in a well oiled dutch oven until crispy and golden brown on the outside and then add in a pile of sausage to the mix. In a separate saucepan heat up another swirl of oil and cook the onion, bell pepper, celery and garlic. Add it to the pot along with a smattering of fresh herbs, a large can of tomatoes and a few other flavor inducing accoutrements. Drop the lid on, turn the heat on medium low and wait for the magic to happen. Abra Cadabra, ooh la la. For the final act, drop a little (or a lot) of seafood onto the top of the jambalaya. Push it down gently to submerge it in the tomato liquid. Pop the top back on and let it sit for about 5 to 10 minutes or until cooked through. Serve over steamed rice and enjoy a little slice of creole inspired heaven along with one hunger satisfied husband. Mix together the first 9 spices in a bowl. Coat the chicken completely reserving 1 tablespoon of the spice for later. Add 2 tablespoons of the oil into a large dutch oven and heat on medium high heat. Toss in the chicken and sear it for about 2-3 minutes on each side. Slice up the sausage and add it in to the pan with the chicken. Let sear for a minute or two. Turn the heat down to medium low. In a separate sauce pan, heat up the remaining tablespoon of oil on medium heat and add in the onion, green pepper, celery and garlic. Add mixture to dutch oven along with the bay leaves, oregano, thyme, tomatoes, Worcesterhire and the reserved tablespoon of spice. Swirl a spoon around a few times to roughly mix the ingredients and then cover and let sit on medium low heat for about an hour. After an hour, add the shrimp into the mixture, cover and let sit for about 5 to 10 minutes until cooked through. Adjust seasonings as necessary. Serve over steamed rice. First up, before I start talking about my yummy plate of spaghetti this morning, I need to stand up and acknowledge my new blogging friend Jackie over at Lumps on a Blog. 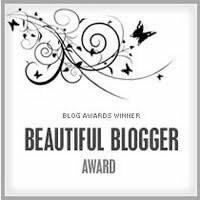 She bestowed a Beautiful Blogger Award upon me. Thank you so much Jackie for thinking of me, I feel honored to be in your list! Second, I am excited to announce that I have been chosen along with three other bloggers to host the upcoming Hebrew National Picnic here in Charlotte! You can get more information by clicking the button over on the right side of my blog, but the basic premise is a large community picnic with bands, games, food, and most important to me, a community service project to help out a local charity and give something back to our community. The date for the picnic is set for June 13th from 11:30 to 3:30 at Freedom Park. I will be providing more information as the date gets closer. Finally, I’m a guest blogger over at Ma What’s for Dinner today. I’m excited to have a chance to write for Alex; I consider her a close foodie friend of mine. So be sure to stop by and check out her site! Ok, on to the good stuff! Who’s in the mood for a big hearty plate of spaghetti? A good friend of mine who shall remain nameless (Hey Barbara, thanks again for a delicious dinner and the fresh meat! ), had us over for dinner at her home a couple weekends back and cooked us the most delicious meal I’ve had the privilege to eat in a long time. Her home is amazing, her family is beautiful, and her cooking is incredible. Between the idyllic surroundings and the incredible presentation of the food put before us, I literally felt like I was on an episode of Barefoot Contessa. They raise their own animals on their property; organically, free range, grass fed… you know, everything that makes meat taste the way it should – DELICIOUS. They had recently slaughtered one of their pigs and one of their lambs. After finishing up an incredible leg of lamb, we were offered to take with us, two pounds of pork sausage from their pig. There was no way I could turn this down. Not only is sausage one of my favorite foods EVER, but this particular sausage was local grown right here on the property and I knew it would be better than best. So here I was with my sausage in hand, trying to figure out a way to use it best and of course, spaghetti came into my mind. I know it’s probably not the most creative way I could use it, but dang if I don’t love a big plate of hot steamy spaghetti. And if the sauce is done right, well, you might as well just park me at the table and say goodbye because I won’t move until every, last, bite, is licked and cleaned from the plate. And let me tell you, this sauce (and meat!) didn’t disappoint. Every plate was licked clean in this house and there was even some sauce left over which I promptly used to make homemade pizza a couple nights later (we’ll be talking about that in a couple days when I attempt to concoct a pizza crust using my friend Butteryum’s pizza crust advice. Here’s what you’ll need to whip up a batch of your own spaghetti delicious. Grab yourself a large skillet and cook your sausage on medium high heat. When the sausage is cooked through, set it aside, drain your excess fat, reserving a teaspoon or two in the skillet. Then add in your onion and garlic. Cook that up for 3-5 minutes or until onions are cooked through. Once your onions are cooked up, add into the skillet your remaining ingredients; the diced tomatoes, tomato sauce, tomato paste, red wine, vinegar, sugar, peppers, basil, red pepper, oregano, parsley, onion powder, bay leaves and salt and pepper. Finally add your cooked sausage back into the pot. Stir it all together. Now this next part is not scientific or exact. Cook your sauce on low for as long as you can. 1 hour or 24 hours, it will all work and taste good, but the longer you can let it simmer, the happier you will be. I have a friend that lets her sauce simmer all day. Then she refrigerates it, pulls it out the next day and cooks it all day again before serving it that night. Yum! I cooked mine for two hours before serving it up. It’s all I had to work with and it was still super duper yummy. One additional tip before we wrap this up. For those of you who have spaghetti sauce that will never stick to your noodles, let me give you two small pieces of advice that might help you in your future spaghetti devours. First off, don’t put oil in the water that you’ll be boiling your noodles in and second, don’t rinse your cook noodles. Both of these acts will cause your noodles to avoid your sauce; one because you just slicked up your noodles and the other because your rinsed off the starch that helps the sauce to stick in the first place. Now all that’s left to do is sit back and enjoy your spoils! Grab a large skillet and cook the sausage on medium high heat. When the sausage is cooked through, set it aside, drain the excess fat, reserving a teaspoon or two in the skillet. Add in your onion and garlic. Cook for 3-5 minutes or until onions are cooked through. vinegar, sugar, peppers, basil, red pepper, oregano, parsley, onion powder, bay leaves, salt and pepper. Add your cooked sausage back into the pot. Now this next part is not scientific or exact. Cook your sauce on low for as long as you can. 1 hour or 24 hours, it will all work and taste good, but the longer you can let it simmer, the happier you will be.